As we move to the fall season, until recently the stock market almost daily hits another new record, but some clouds are appearing on the horizon. Only time will tell if the storm clouds blow away or if a hurricane is on the way. “NOAA study finds Houston’s 100-year floods have been underestimated,” was the Houston Chronicle ‘s headline, November 27, 2017. Author, Mihir Zaveri wrote, “A higher rainfall estimate for a 100-year storm means developers would need to design subdivisions and strip malls to compensate for higher runoff, and more existing residential and business properties would be included in new floodplain maps that drive insurance costs and development regulations.” The National Oceanic and Atmospheric Administration completed the analysis. Just as it is the case that our infrastructure, our society, and our homes can be designed and built to be resilient to a certain level of risk, it follows that our life savings can take advantage of better technology and implement thoughtful strategies that can better prepare us for scenarios that are difficult at best to forecast. According to me, it’s not about the prediction of the future it’s all about the preparation for the future. “It is really important that rational players know how to separate two things, risk and price, which can coexist indefinitely as they rise together. Until one day, they don’t,” said blogger Gary at Notes from the Rabbit Hole. According to Warren Buffett, “Risk comes from not knowing what you’re doing.” An investor should always do his or her homework before making decisions. 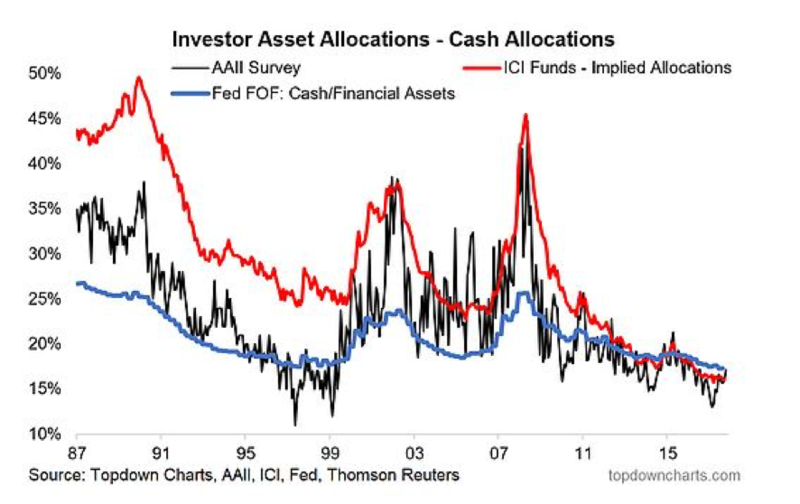 Here’s a chart from the founder of research firm Topdown Charts, Callum Thomas, showing investors have reduced their cash allocations to “rock-bottom” levels. In January, I will celebrate 40 years in the securities industry. Unfortunately, it appears to this observer that my industry has only taught investors two mantras; buy low/sell high and buy and hold. When it comes to buy and hold, please allow me to draw a line in the sand. When making contributions to your portfolio buy and hold is your friend as you may be able to buy shares at discounted prices when the market is in decline. But such practice may become your foe when you are taking income from your life savings. If you were over 70 with $1,000,000 in a traditional retirement account on January 1, 2008, and to keep the math simple you took 3% or $30,000 in income and ‘hurricane credit crisis’ took 57% away from you, your total account decline becomes $600,000, leaving you with $400,000. After 70 ½ you are required to take increasing withdrawals from traditional retirement accounts for the rest of your life. And to get back to your original $1,000,000 from $400,000 means you need a gain of 150%. Savvy investors are inspired to see in advance of an event what could be done to potentially minimize losses. Investors deserve more than an apology. Instead of letting you believe hope is a strategy, here’s what I recommend so that you can be prepared for the good, the bad, and the unforeseen. Ask your current investment professional to show you what they have learned in the past decade where there were two severe market losses (2000-02 & 2008-09). Astute advisors often employ goals based software that can help you see your probability of retirement success. One couple in their 70s could see that their probability for success through age 100 was 91%. When newer technology is put into the equation, we can see that if $40,000 was withdrawn from their $1.5 million to do a backyard pool repair the odds slipped to 75%. Now the couple can review other options as well. In another case, a couple with $220,000 has yet to retire, but they were able to see for the first time that they would like to limit their losses where possible to 20% or -$43,000. They were more surprised to see that in 2008 their actual losses were 41%, but now they can see how in 2008 the losses could have been limited to 18%. Which means that instead of taking about four years to get back to their beginning 2008 balance, full recovery was obtained in less than two years. You don’t need to see a disaster to be prepared for one. 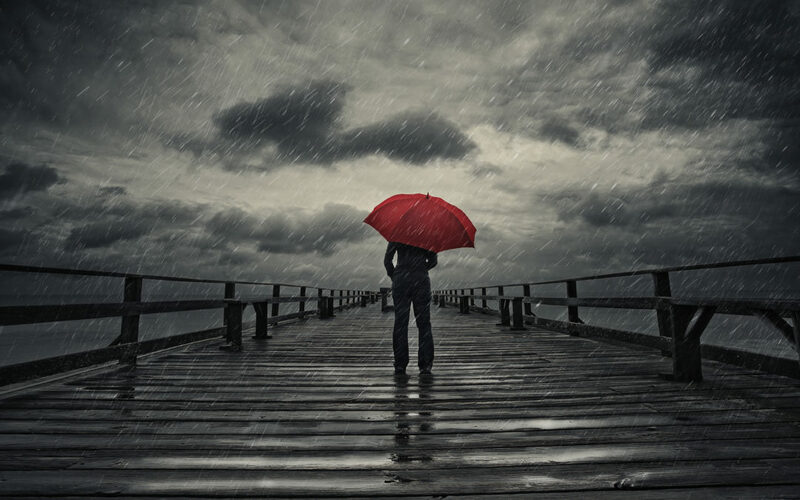 You should, however, see what disasters your investments might face given the current asset allocation. (EMoney and AssetMark software were employed to see this information. I am not interested in naming the firms. I am interested in describing ways investors can learn from the past to potentially minimize losses when markets turn viciously negative again.) Suppose it was you that was not willing to lose more than 20% although your investments lost 41% in 2008, wouldn’t you want to make some changes? By analogy, if a hurricane is in my path, instead of lying in complacency you can count on me to make some changes in advance by following the horses to higher ground. “Diversification seeks to reduce the volatility of a portfolio by investing in a variety of asset classes. Neither asset allocation nor diversification guarantee against market loss or greater or more consistent returns. Securities offered through Securities America, Inc. (SAI), Member FINRA/SIPC. Advisory services offered through Securities America Advisors, Inc. Investors Advantage and SAI are separate entities. Important Information from FINRA to consider before transferring your account. Trading instructions sent via email may not be honored. Please contact my office at (805) 495-2077 or Securities America, Inc. at 800‐747‐6111 for all buy/sell orders. Please be advised that communications regarding trades in your account are for informational purposes only. You should continue to rely on confirmations and statements received from the custodian(s) of your assets. The text of this communication is confidential and use by any person who is not the intended recipient is prohibited. Any person who receives this communication in error is requested to immediately destroy the text of this communication without copying or further dissemination. Your cooperation is appreciated.